A happy gut makes for a happy vacation. Travel requires meticulous planning. Outfits need to be coordinated and packed. Itineraries need to be written down and crossed out and written down again. Accommodations have to be researched and settled upon. The list goes on and on, but rule of three; I wouldn't want to keep you trapped in opening paragraph purgatory forever. If you're a traveling pro, you already know all this stuff anyway, and if not, as long as you booked a hotel and got a plane ticket, you can intuit a lot of the rest. That said, there is one particularly boring and unsexy facet of travel that people tend to forget, despite the fact that it has the power to make or break your vacation: stomach health. It's fairly conventional wisdom that any sort of illness can ruin a trip but while certain things are unpredictable, there are plenty of tactics available to help you keep your stomach healthy while out on an adventure. Remember, a happy gut makes a happy traveler. The first step on your journey doesn't begin at the airport. It begins the day before you fly. Food takes about six to eight hours to pass into your large intestine, where it digests further before...you know. The point is, it's important to eat correctly the night before you head out. Don't eat a big Indian dinner or a whole mess of tacos if you know you're going to the airport in the morning, and especially don't try any new exotic cuisines. If you've never had Moroccan food, maybe wait until you get home before trying that new restaurant that opened up by your house. Eat something that'll give you energy for your day of travel, but won't leave your stomach in knots the morning after. Okay, so you've heeded my advice and made it to the airport. Your stomach feels great, except for a slight rumbling. You're hungry. Now, you may be tempted to buy that family-sized trail mix bag–yes of course the one with the M&Ms;–and hose it in the waiting area, but don't. No. Put it back. It's literally a bag of candy. It's going to make you sick. Come on. You're better than this. You need a game plan. First, calculate not just the time you're in the air, but the amount of travel time to and from each airport, as well as the amount of time it'll take you to get from the hotel to wherever you're eating your first meal. Before your flight, it's recommended that you have something with plenty of fiber in it, like a green smoothie. It may seem counterintuitive, but something easy to digest can help settle your stomach for the entire flight. 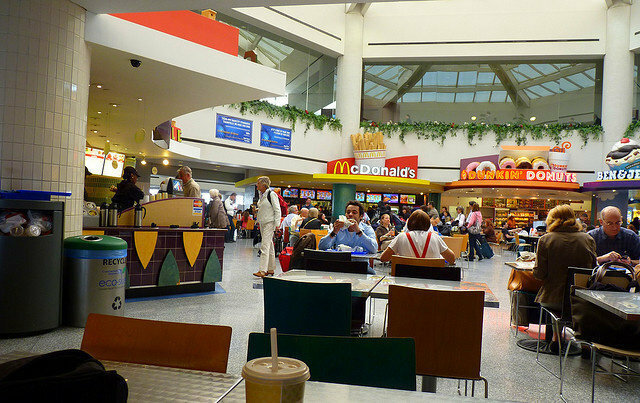 If you're going long distance, you may want to buy something from one of the airport restaurants like a salad with some sort of healthy protein in it. 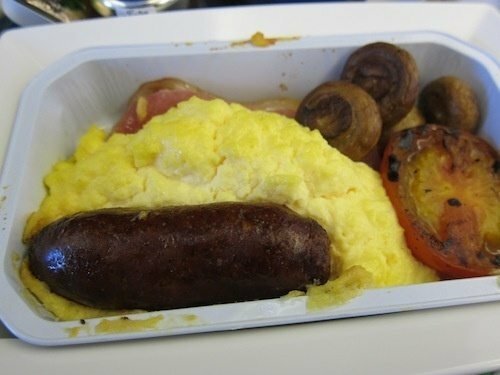 Odds are, the food the stewardesses are serving isn't going to be very nutritious or tasty. Bonus: if you think you'll be hungry by the time you land, snag a healthy snack, like the unsalted, M&M-less; trail mix (I know, what's the point?) to eat on your way to your hotel. Also, remember you don't need to drink before or during your flight, the lack of oxygen will make you drunk faster, and can even lead to a middair hangover. Alright, you've landed in a foreign country, and the plane ride went off without a hitch. This doesn't mean you can stop worrying about your gut. It's important to realize that the restaurants in whatever country you're in might not have the same sanitation requirements as restaurants in the United States. In order to prevent the nightmare of spending your vacation on the toilet, pack or purchase some probiotics. If you tend to suffer from Diarrhea, something that contains Saccharomyces boulardii is a great option. If constipation is more your issue, try something with magnesium citrate. The other issue when abroad is tap water. Certain countries, like Cambodia and India, have notoriously unclean water, but even if you're not spending your vacation in the third world, you're probably better off drinking bottled water for the entirety of your stay. It may cost you a bit more, but it'll help guarantee your stomach remains well-behaved during your trip. Alright, I've given you all the stomach advice you could possibly need or want. Whether or not you heed it is totally up to you. That said, assuming you're not travelling alone, your health doesn't just affect you, but the people you're travelling with as well. Everyone will have a better time if you're at 100%.